Details at the end of this post on how to enter to win a copy of Grace Sees Red, and a link to purchase it from Amazon. Grace Wheaten is the curator and manager of the beautiful Marshfield Manor. It’s open to the public for tours as well as being the setting for antiques and collectibles. Bennett Marshfield is the man in charge, but since Grace recently found out she’s his niece, he’s been grooming her to take over operations. Frances is Grace’s cranky assistant, although from her manner you’d think she ran the place single-handedly. This time she has to ask for help, and it’s not something that comes easy for her. Frances disappears every weekend, but no one ever knew where she went. Now the secret is out. She’s been visiting her disabled ex-husband in an upscale nursing home. Grace is stunned. Who knew Frances had ever been married? Percy, the ex, shares a luxury apartment with two other men, one younger and one a grouchy old man. It seems the old grouch has turned up dead, and thanks to a nosy orderly, the police have been called. It could have been a suicide, an accidental mishap with drugs, a mercy killing, or flat out murder. Grace has been involved in murder cases before and has the ability to get answers when the police can’t. This time the stakes are high. Frances is the main suspect, if it’s murder, thanks to an argument they had earlier in the day. In addition, Grace’s roommates Scott and Bruce, have to move from their wine store. The second floor storage space collapsed and landed in the first floor, destroying much of the stock. The building is unsafe. If a new location isn’t found soon, they’ll be out of business. Frances can be less than gracious most of the time but when she’s forced to ask for help and reveal her private life for the entertainment of local gossips, it’s almost more than she can bear. She’s grumpy and rude. Luckily, Grace is used to her behavior and has more patience than six people in dealing with her. Grace is coming into her own as a Marshfield relative. She’s a bit hesitant but has great ideas to implement. Readers get to see more of Frances and learn what makes her tick which adds depth to her character. Marshfield Manor is a place you’d love to tour, with a snack in the café, and a chance to just sit and drink it all in. The mystery is a good one with twists and turns that have even Frances worried about the outcome. The suspense at the end will have you holding your breath for at least eight pages. 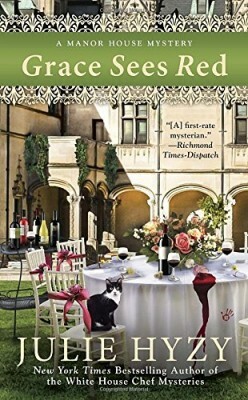 This is book seven in the Manor House Mystery series. The very last line of the book promises book eight will be just as exciting. Julie Hyzy also wrote the White House Chef mysteries with nine in that series—very enjoyable, lots of food talk, and more suspense. To enter to win a copy of Grace Sees Red, simply email KRL at krlcontests@gmail[dot]com by replacing the [dot] with a period, and with the subject line “grace,” or comment on this article. A winner will be chosen July 9, 2016. U.S. residents only. If entering via email please include your mailing address, and if via comment please include your email address. Have added this to my TBR list and can’t wait to read it. I am totally in love with this series and would kill to add this one to my home water. I swear one day Grace will find herself so deep underwater she’ll need water wings to get through it. A recent post from Nora-Adrienne: July is almost here, let’s see what’s new! I’ve always enjoyed Julie’s books!! This is a terrific series, and I would love to win the newest entry. I’m really looking forward to reading this one. The cover caught my eye! This is a wonderful series! I can’t wait to read “Grace Sees Red”. Thanks for the chance. Great review on one of my very favorite series! Thanks for the chance to win. I’d love to win this! Thanks so much for the chance! !